Our 3 bedroom, 2 bathroom condo is located at 8711 Rockingham Terrace. It was one of the first units to go up and it was the location that won us over. 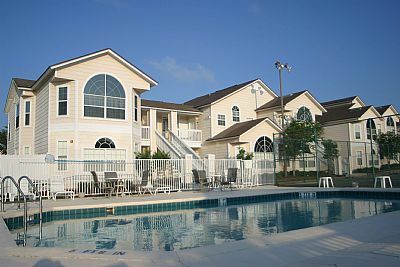 The condo is right in front of the swimming pool and main clubhouse complex. 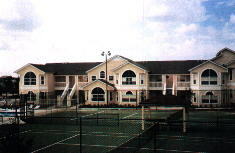 Step outside the condo are you are literally 20 feet away from a heated swimming pool, soothing Jacuzzi spa, paved tennis court, kiddie playground, shuffleboard, volleyball, BarBQ grills and the clubhouse that features a fitness center and video arcade. The condo itself offers a spacious 1350 square feet of living area -- or 4 to 5 times more than you would be getting for single hotel room. The condo sleeps 8. The Master suite offers a King bed, television set and a bathroom complete with a huge, walk-in shower. 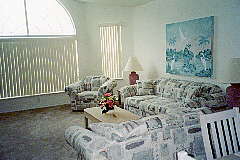 The second room has a Queen-sized bed and the third room offers two twin beds. All rooms have walk-in closets. The second bathroom comes with a cozy bathtub. The living area is spacious with an open kitchen complete with all utensils like plates, glassware and silverware. All of the appliances you need are there too like a roomy refrigerator, oven stove, modern over-the-range microwave over as well as a coffeemaker and toaster. Yes, an automatic dishwasher is there too. You can do your laundry in the condo as you have a full-sized washer and dryer too. You can find the floor plan here. The living room and dining room are wide and open. The sofa in the living room opens up to a queen convertible sleeper if you need the extra bedding. Both television sets in the home offer more than 70 cable channels, covering everything from ESPN to Disney Channel to Nickelodeon to CNBC (and more). As a recent perk, unlimited local and long-distance calling is provided in the condo. The way some hotels charge for their outgoing calls you will be glad to have this provided for free. Bath towels, pool towels and spare linens are provided too. Rates are reasonable, starting as low as $79-$109 a night for weekly stays during off-season periods. If you plan to stay for a few weeks or longer, substantial discounts apply. You can check availability here. Then call 1-800-895-6250 or 407-390-9002 and have Barbara or Brenda and ask to book the 8711 Rockingham poolside condo at Island Club. They will provide current rates and any specials. Even if this condo isn't available they will likely have something available.